Brunswick Patent Application US 2018/0335788 A1 for “Systems and Methods for Raising and Lowering a Marine Device on a Marine Vessel” was published 22 November 2018. 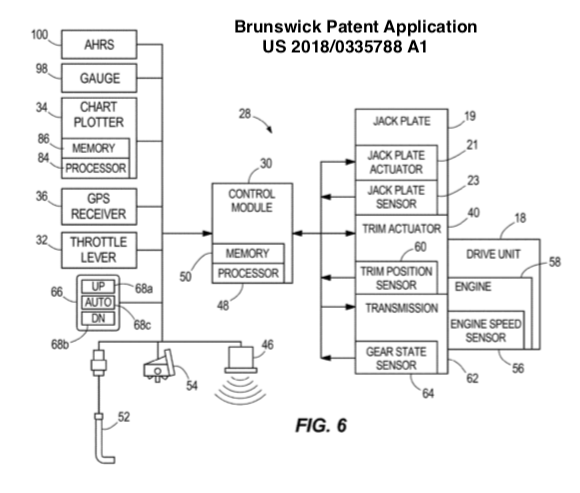 The patent application provides some automatic modes for monitoring drive trim, jack plate height, water depth, GPS location, heading, navigational map water depth, speed, throttle position, and other variables to prevent groundings of the marine drive when underway (striking bottom). The system automatically alerts the operator and takes action (trims and raises the drive) when it detects potential groundings. U.S. Patent 9,944,375 Systems and Methods for Controlling Trim Position of a Marine Propulsion Device on a Marine Vessel. U.S. Patent 9,290,252 Systems and Methods for Controlling Trim Position of a Marine Propulsion Device on a Marine Vessel. U.S. Patent 9,927,520 Method and System for Close Proximity Collision Detection. U.S. Patent 10,118,682 Method and System for Controlling Trim Position of a Propulsion Device on a Marine Vessel. Some of the patents listed above try to avoid impact with floating or submerged objects. Avoiding debris at speed can prevent outboard motors from striking debris, breaking off, and flipping into boats. Similarly, Brunswick’s most recent patent application has to do with preventing groundings of the marine drive when underway. Groundings can also result in outboard motors breaking off and flipping into boats. We are glad to see Brunswick working in these areas and hope to see these systems on vessels in the marketplace in the future.